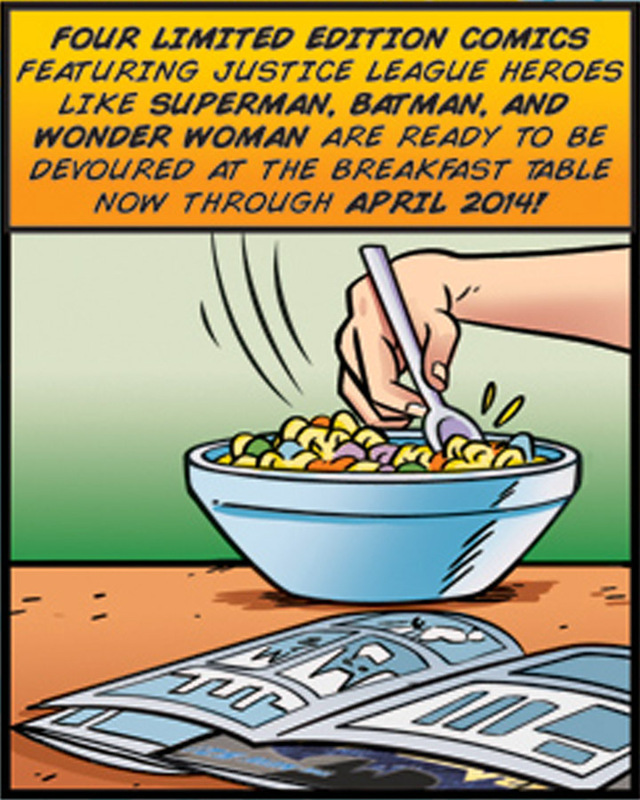 As they say, “for a limited-time-only,” you can find a comic book featuring DC Comics’ Justice League characters in “specially marked” boxes of General Mills Big G cereals. That will appeal to kids from all over as well as those who are still kids at heart. Minneapolis (Mar. 3, 2013) – Back by popular demand, select General Mills Big G cereals now include four collectible comic books featuring the iconic DC Comics’ Justice League characters, on shelves now through April 2014. Four specialty issues created exclusively for General Mills, in partnership with DC Entertainment (DCE) and Warner Bros. Consumer Products (WBCP), can be found in grocery retailers nationwide, with a bonus fifth issue available only in select boxes of Cheerios™ at Target. Each specially marked box of Big G cereal also features several DC Comics Super Hero costume piece cutouts on the back. Fans are encouraged to put them on to strike a Super Hero’s pose, with chest out and hands on hips, to participate in #SuperHeroing, a social media movement to show how to start off the day with confidence… just like everyone’s favorite Super Heroes. Photos can be shared over Twitter, Instagram, or Facebook using the hashtag #SuperHeroing. Like any good comic book with a nail-biting cliffhanger, fans who have read Part One of each in-box comic book can then visit here to read Part Two. Participating Big G cereals include Cinnamon Toast Crunch™ (12.2 oz. and 21.25 oz. ), Lucky Charms™ (20.5 oz. ), Honey Nut Cheerios™ (12.25 oz. and 21.6 oz. ), Trix™ (10.7 oz. ), Cookie Crisp™ (11.25 oz. ), and Reese’s® Puffs® (13 oz.). Visit here to get more information and view exclusive General Mills and DC Comics content. To find Big G cereals near you, please visit here.